That quote popped into my head after spending the day with Chef Norbert Niederkofler. For some time, I had been hearing talk of a small eleven-table restaurant called St. Hubertus, high in the Italian Dolomite Alps, where a South Tyrolean chef was pursuing a new kind of cooking that takes local sourcing to a whole new level. 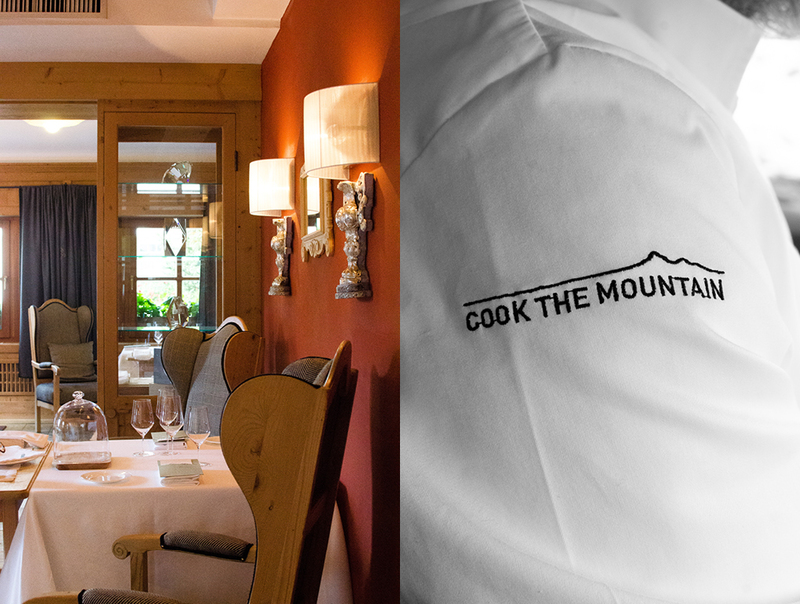 It was early fall when we arranged to meet to talk about food and cooking, or as Norbert calls it “cooking the mountain”; and this area is truly all about “the mountains”. South Tyrol, or Alto Adige as it is often called, is a province in northeast Italy. It is a territory that spans tremendous changes in elevation, encompassing a valley, up to the Dolomites, the high plateau of the Plätzwiese region, and the ski resort area of Kronplatz. 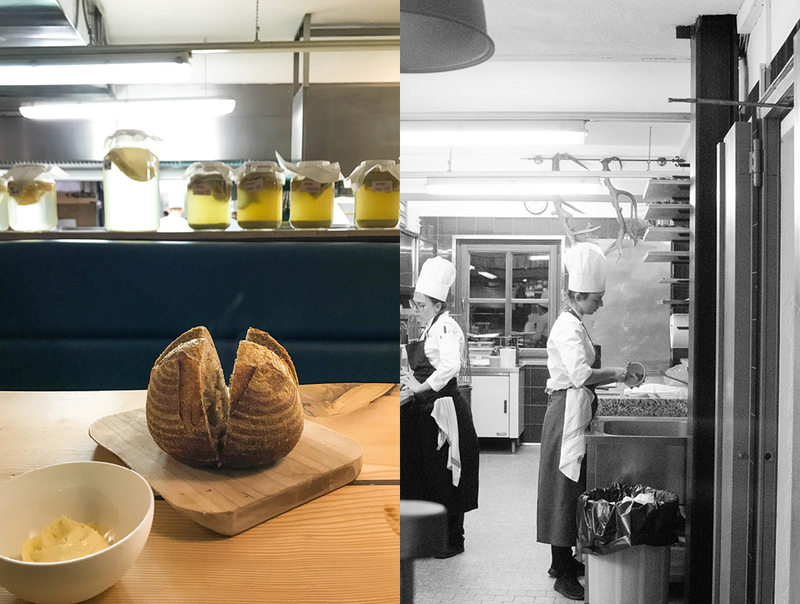 Norbert’s mission is to strengthen the South Tyrolean culinary identity and support the region’s unique gastronomic culture. 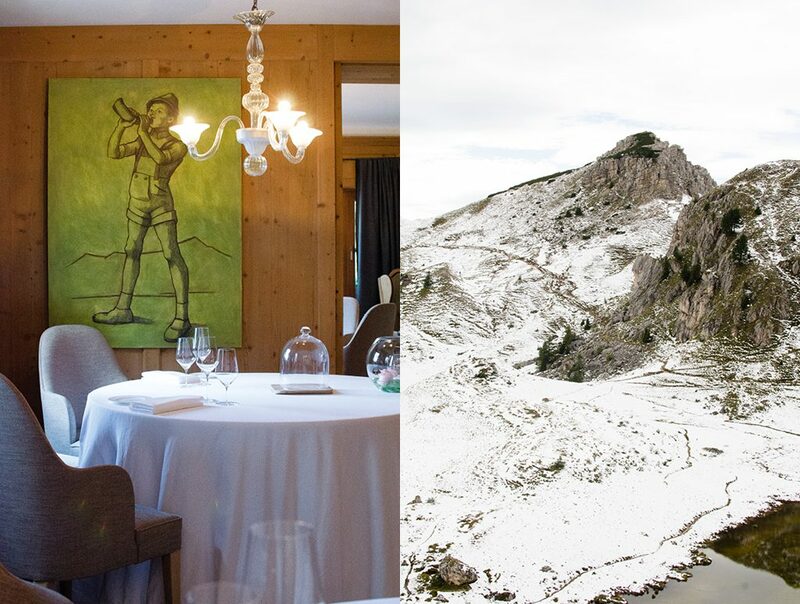 Amazing dining options are plentiful in Alto Adige: 19 restaurants there hold 26 Michelin stars. Three of those stars are Norbert’s! Growing up not far from his restaurant, St. Hubertus, in San Cassiano, Norbert is an avid skier, a skill that is not unusual for residents of these parts. 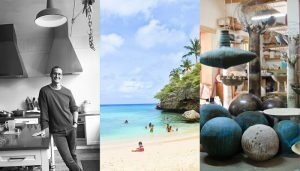 He decided early on that he wanted to travel the world and cook. For many years he worked in the world’s capitals, London, Zurich, Munich, Milan, New York, at some of those cities’ best kitchens. But having conquered the culinary world, when Norbert was offered the opportunity to return and take over St. Hubertus, he jumped at the chance to apply his craft close to home. From the town of Bolzano, deep in the valley at 860 ft above sea level, we made our way along narrow, winding alpine roads, climbing to San Cassiano, just shy of 5,000 feet. As we climbed with windows down, the air took on a bracing chill, getting fresher as we rose, mixing with the smell of pine. Nestled in the crown of the majestic Dolomites, St. Hubertus operates within Hotel Rosa Alpina, a five-star property that seeks to push alpine luxury to its heights. The restaurant opened its doors under Norbert’s leadership in 1996, closing what had formerly been a pizzeria, and starting a new chapter catering to the hotel’s well-heeled clientele. It severed amazingly crafted dishes with the best produce sourced from all over the globe. Then ten years ago Norbert had an epiphany. 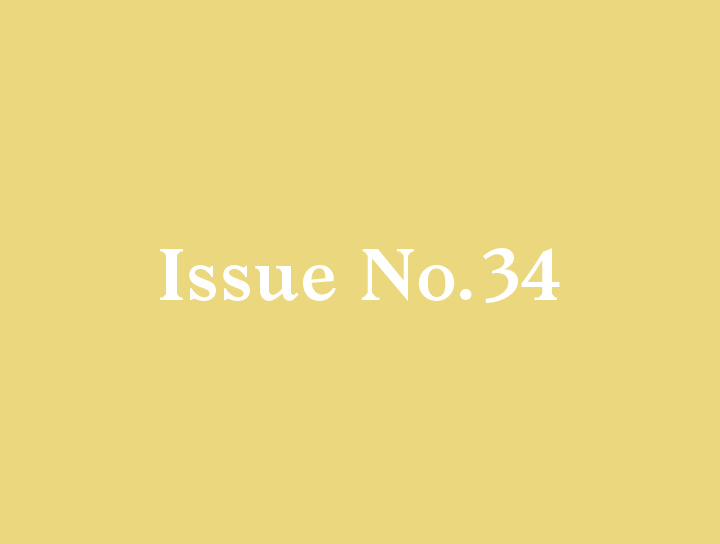 Why was he, at great financial and environmental cost, importing the world’s finest ingredients to bring to San Cassiano a cuisine that could be already be experienced in the world’s capitals? 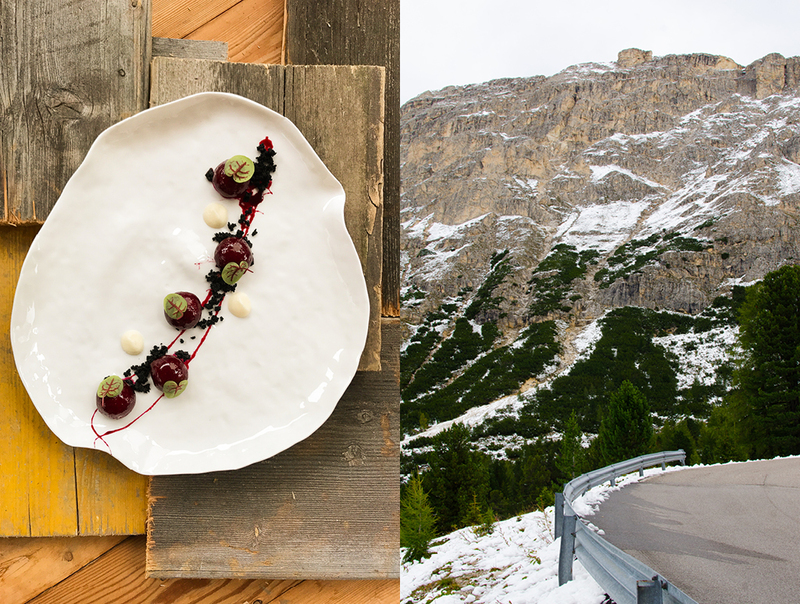 If you made the effort to travel to San Cassiano for the stunning scenery, the fresh air, the local activities, wouldn’t you also want your dining experience to be sourced locally? But was it even possible to cater to Hotel Rosa Alpina’s five-star crowd with the limited resources available at these high altitudes? 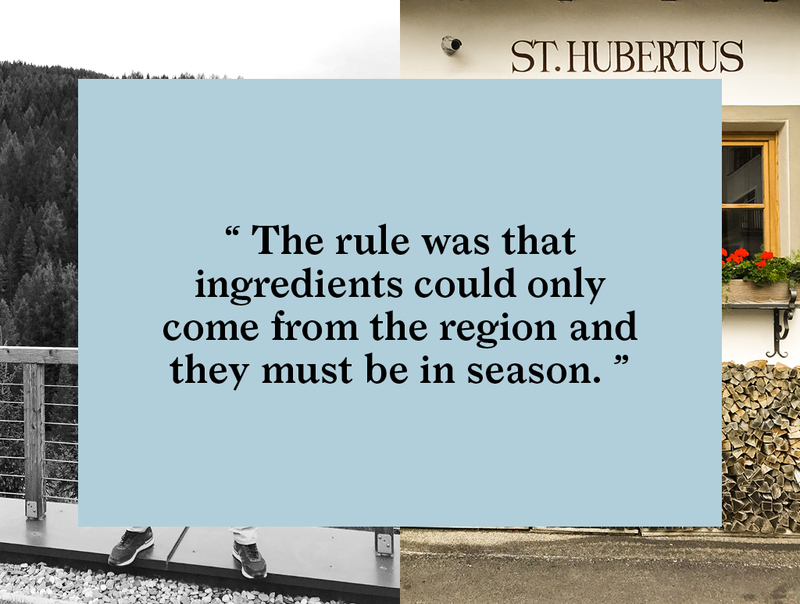 After all, local sourcing sounds great, but St. Hubertus’ guests are still going to be unbending in their demand for a full eight-course gourmet experience. 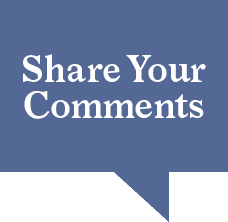 The answer to these questions could only be had in the doing and Norbert, convinced that “local” was the way forward, said “Basta!” enough is enough. 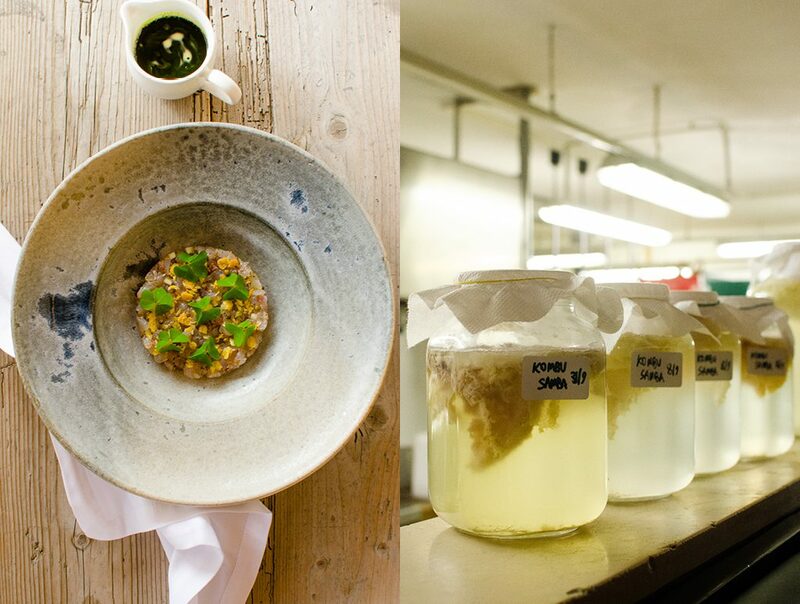 Taking an enormous leap, he removed the Foie Gras and all imported ingredients from his menu. He drew a line in the sand, or snow as is more likely the case in San Cassiano. He started a new chapter in his career. What a risky move. 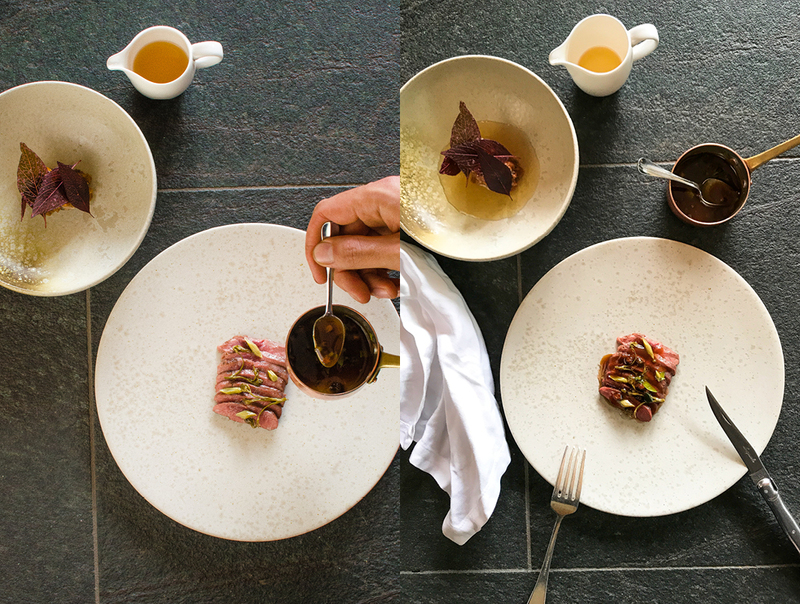 With a very successful restaurant, a stellar reputation, fully booked tables every night with happy patrons, an experienced kitchen team that knows how to deliver, you turn 180 degrees into the unknown almost overnight! Norbert began researching what was growing in and around San Cassiano. 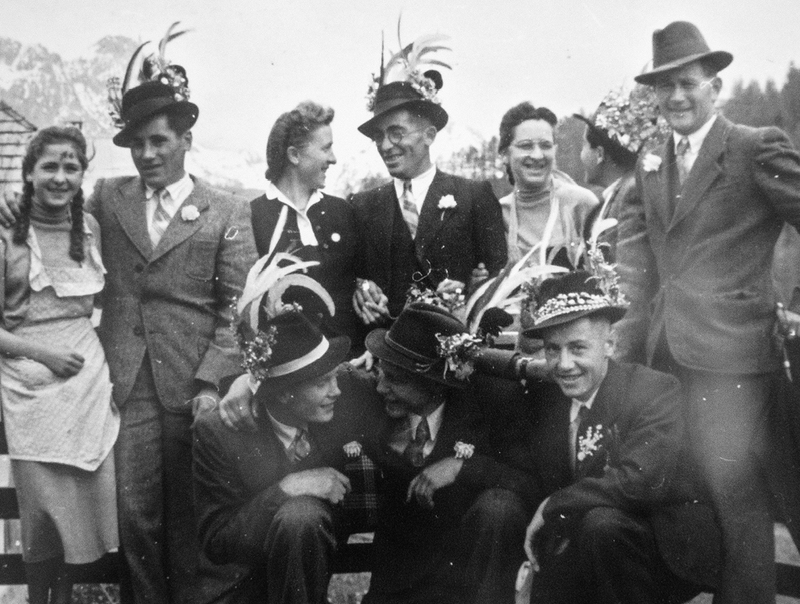 He forged relationships with farmers and producers, reinventing the culinary wheel as he went along. The guiding principle was that ingredients could only come from the region and that they must be in season. Even with a basic ingredient like olive oil—olives don’t grow in these parts—Norbert found local substitutes; grape-seed oil is locally plentiful. Each new ingredient built out a unique flavor profile particular to St. Hubertus. The result is a regional cuisine – which just can’t be had anywhere else – elevated to the highest standard. While Norbert and I compare notes on our favorite haunts in New York, a few dishes arrive that Norbert has ordered for our tasting pleasure. First out is a beetroot gnocchi – potato gnocchi cooked in a beetroot reduction to give it a subtle added taste and color, with a cream of daikon cress and “beer soil” to add texture, made by dehydrating beer, bread, and charcoal. Along with that is served a white fish tartare freshly caught in local rivers, the removed scales fried to a bright crunch and yellow color. The scales add great texture and a slightly salty taste, with a sprinkling of clover to finish it off. Andrea disappears into the kitchen to get to work as Norbert fills me in on Andrea’s outstanding work at St. Hubertus. For his sourdough bread, he works with a small mill in nearby Lombardia and has them roast the wheat to his specifications. With the fermented dough and roasted wheat, the bread is more akin to a fermented drink in solid form. His other passion is Panettone, for which he has an amazing recipe on his blog. It is a multi-day project so not a dish to make on a whim. Forty-five minutes later, to the minute, the Tarte Tartine arrives, with freshly made vanilla ice-cream. Yes, you read that right, each serving is made from scratch for each diner, the Tartine, AND the ice-cream. I got the shots and we all dug in. It was otherworldly! Amazing! 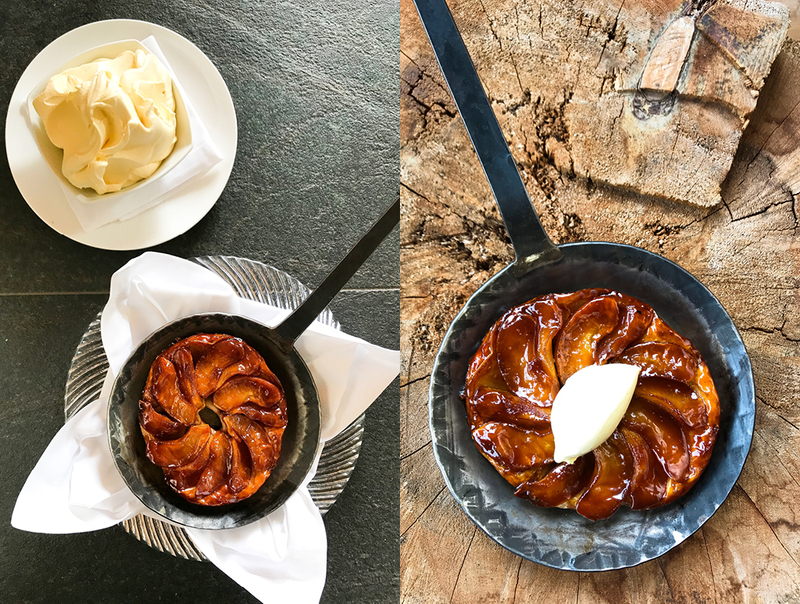 Even days later the taste came back to me in a dream – a dish worth climbing the alps for. It’s about an hour before service starts so Norbert suggests we take a quick drive up the mountain and get some scenic shots of the area and see museum Forte Tre Sassi, at the Valparola Pass in the Dolomites, a place where intense fighting took place in World War I between Austria and Italy. 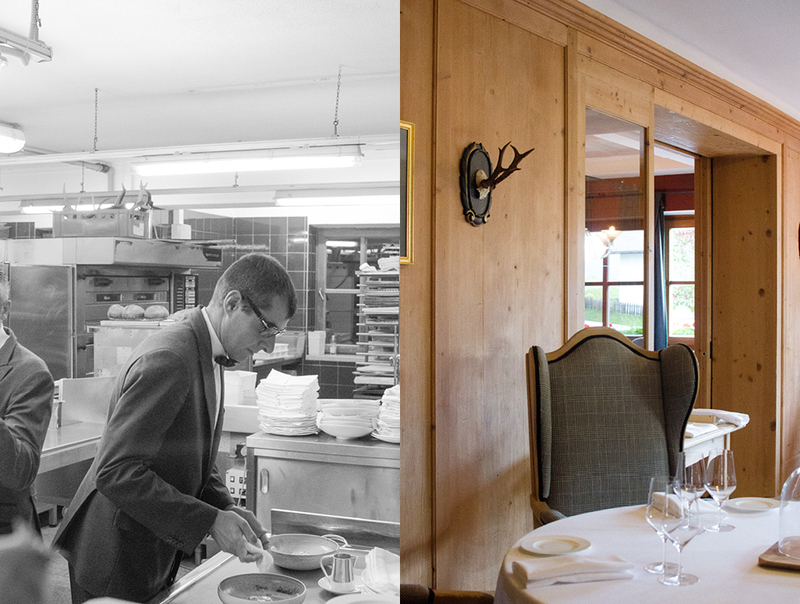 Rushing back, it’s time for Norbert to gear up for dinner service, and the dining room is in full swing — linen ironed, silver polished, the staff quietly checking that the room is perfect and ready for the night’s performance. We take our seat at the chef’s table in the kitchen, giving us a front-row view of the night’s culinary performance. Our eight-course menu is on a Fall theme with pine, lamb, trout, and eel. Each dish is executed perfectly and served by an amazing staff that explains the makeup of the dish. We also get to taste Andreas’s fabulous bread. 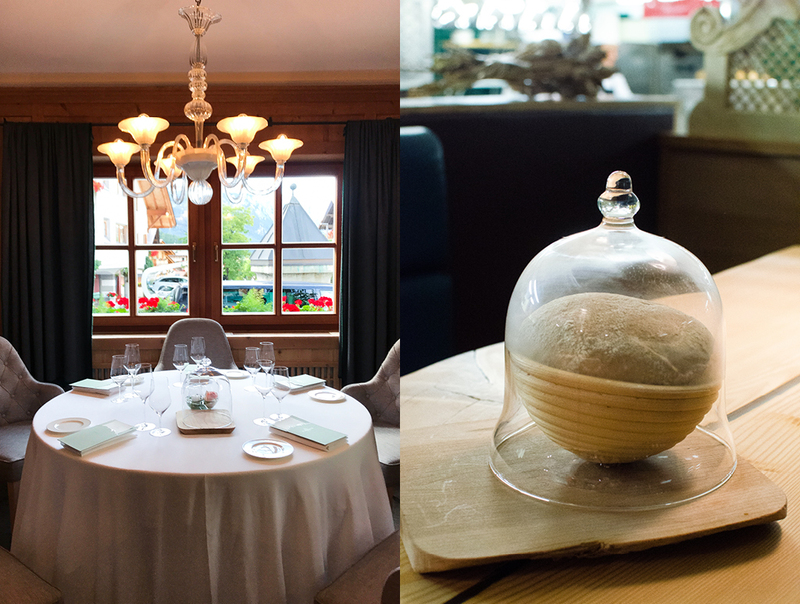 As our meal begins a fresh ball of dough graces our table, undergoing its final resting stage in a glass bell jar. Our waiter retrieves it for Andreas to bake, and soon it is back, served warm from the oven. What a treat. 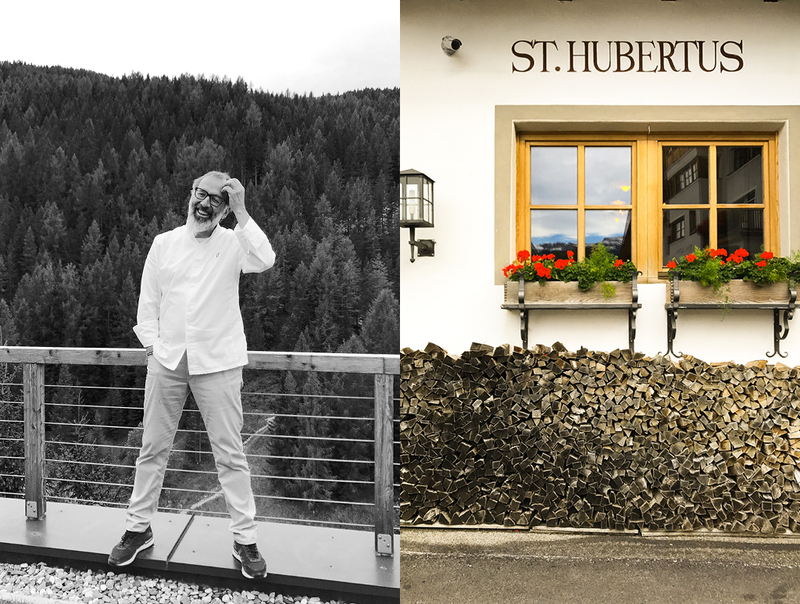 Palates satisfied, tummies full, and many stories to share, we bid Norbert and his team at St. Hubertus adieu, winding our way back down the hill to our hotel in the valley below. St. Hubertus is one of those totally unique restaurants that can easily be the object of a holiday trip. An experience truly worth traveling for. Planning a trip to Alto Adige? Here is the current weather and what to expect for the next few days.